The apple insect tools in NEWA now include degree day forecasts to provide insight on upcoming pest events. Many orchards will soon be progressing to the stage where some insecticidal protection is typically needed. There are prediction tools that combine the Cornell University, Geneva, historical records with the best biological projections we can offer, found on the NEWA Apple Insect Models website. We recently completed improvements to the “Real-Time” apple insect IPM decision support system, which can deliver relevant, current information on weather data and pest populations to facilitate grower IPM decisions throughout the growing season. The system tracks seasonal development of fruit bud stage and key insect pests using degree day models. The models indicate pest status, pest management advice and sampling options, and are linked, Pesticide Information, to an interactive system that helps growers choose appropriate materials when pesticide use is recommended. Insect pest developmental stages are calculated from degree day (DD) accumulations at weather stations. The insect pests addressed include: apple maggot (AM), oriental fruit moth (OFM), codling moth (CM), plum curculio (PC), obliquebanded leafroller (OBLR), spotted tentiform leafminer (STLM), and NOW also San Jose scale (SJS). This website uses DD information based on either historical records or user-entered biofix data, and includes: the start, peak, or progress of the oviposition/egg hatch/crawler emergence period (for CM, OBLR, OFM, STLM and SJS); the start, peak or end of the pest’s 1st, 2nd, etc., flight (for AM, CM, OBLR, OFM, STLM, and SJS); the first occurrence of adult or larval feeding, foliar or fruit damage, or mines (for OBLR and STLM). Access to the Apple Insects tools is through the “Pest Forecasts” list or the “Crop Pages” list “Apples” homepage on the NEWA blue menu. From the Apples homepage, clicking on the link that says “Apple Insect Phenology Models and IPM Forecasts” brings up a state map showing the available weather stations, plus pull-down menus on one side. The user selects a pest of interest, state, weather station, and the desired end date for weather data accumulation. Pest DD models and historical records are used to calculate: Tree Phenological Stage, Pest Stage(s), Pest Status, and Pest Management Information, all of which appears on the “Results” page. We have just finished updating the decision points for these advice categories by incorporating the most current 5 years’ worth of temperature/degree day trends, which should result in more precise predictions. Additionally, the current DD accumulations provided on this page have now been linked to the newly reactivated NEWA Degree Day Calculator, so the results are given in the same format used by that tool: a table of the current accumulated heat units, plus the projected values according to NWS 5-day forecast. A link gives the option of also viewing DD progress on a chart. Insect predictions provided by the tool can be refined and adjusted to reflect current insect activity by user-entered events obtained through field monitoring (such as pest biofix; i.e., First Trap Catch date). 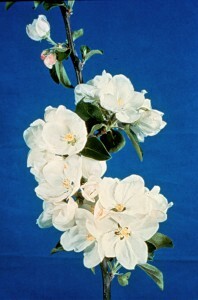 Apple phenological stage can be adjusted according to field observations by selecting from a pull-down menu; this will generally change some of the text provided in the advice boxes. 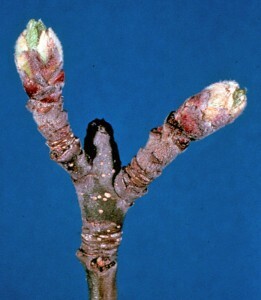 Links on this page can take the user to various other online resources, such as color photos of the bud development stages, NYS IPM Fact Sheets of the pests in question, and when appropriate, sampling charts for use in conducting field samples of specific pest life stages (e.g., eggs, larvae, mines). When a pesticide spray is recommended, a “Pesticide Information” link in the “Pest Management” box takes the user to the Pesticide Management Education Program’s (PMEP) Tree Fruit IPM home page, where a pesticide decision filter helps users pick an appropriate material to use, based on anticipated pest severity and spray program type (i.e., conventional, reduced-risk, non-organophosphate, organic). An improvement to the site we still plan to implement, in collaboration with a colleague at Penn State, is the incorporation of a least-cost product calculator function, to provide users with an estimate of how much they’ll have to pay for a given pesticide choice. A pesticide search returns a series of profiles of all the NY-registered products fitting the specified pest species and efficacy rating. The profile gives the common and trade names, labeled use rate, re-entry and pre-harvest intervals, and EPA registration number of each product. Also included are some general remarks on the range of product efficacy, and any known effects on beneficial species. A “Details” link in each profile box takes the user to a more extensive list of information, including notes on the active ingredient (including its mode of action classification), an overview of recommended use periods, and a link to a scanned copy of the NYS DEC-approved product label, which can be read or printed out. All of the information presented is already available online at various other websites, but the NEWA Apple Insect Models bring these resources together in one place that is more convenient and efficient to access. We are continuing our efforts to refine and improve the accuracy of the Apple Insect Model predictions, and expand the range of sites from which weather data is able to be collected. During this process, we encourage everyone in the apple industry to check this website for themselves throughout the growing season, to see how well it forecasts pest events. We appreciate hearing of any anomalies or irregular predictions generated by using the local data to chart pest development in your growing area, and hope to end up with an IPM tool that is useful and accurate for advising apple growers about what’s going on in their orchards. This entry was posted in about models, news on April 26, 2016 by jec3@cornell.edu. The NEWA website may be down for an hour during an upgrade. The upgrade didn’t go through on Tuesday. The upgrade will be done Thursday, April 14, beginning after 3:00 PM or Friday morning, April 15. Plan accordingly. An upgrade for State-by-State access to Station Pages and to NEWA tools via state drop down lists is complete! You may have already seen how these work in the Weather Data tools, because we’ve already got the state selection in those tools. Find more details about this upgrade at NEWA upgrade downtime – plan accordingly. This entry was posted in news on April 14, 2016 by jec3@cornell.edu. About the Cornell Apple Carbohydrate Thinning Model, from Dr. Rob Crassweller, Penn State. “As a refresher, the Cornell apple carbohydrate thinning model was developed by Alan Lakso at Cornell University and adapted for practical use by Terence Robinson at Cornell University. The model, using fundamental tree physiology, estimates over a season (from bud break) the carbohydrate production by an apple tree (with a set description) and the total demands for growth from the crop and the tree. It calculates a balance of supply to demand each day as the season progresses, using the weather data that is entered from the chosen weather station. “It should be noted that the model does not attempt to model any specific variety or training system. The general carbohydrate balance it calculates has been found to correlate well with tree sensitivity to natural drop and with sensitivity to chemical fruit thinners. Cool sunny periods of good carbohydrate supply leads to reduced natural drop and less response to thinners. Cloudy hot periods result in carbohydrate deficits and lead to stronger natural drop and stronger response to thinners. The four-day running average is used since studies and observations have shown that the apple tree does not respond to just one or two days of good or bad weather but rather has a capacity to respond more slowly to changes in weather. Green tip growth stage on apple. “To utilize the carbohydrate model go to NEWA and then highlight the “Crop Management” tab in the blue banner and highlight “Apple Carbohydrate Thinning”. To choose a station site, maneuver the map below and click on the weather station closest to you; then click on the “Continue” button in the left hand box. Keep a record of your apple varieties’ green tip and bloom dates. You will need to enter these each time you use the model. In the box for “Green tip date” and in the box for “Bloom date” enter the dates when the apple variety of interest reached that growth stage; click the green button “Calculate” and the model will automatically calculate the carbohydrate production, use and remaining balance. Full bloom growth stage on apple. A NEWA website upgrade will be done Tuesday April 12, 2016 at 1:00 PM, there may be up to an hour downtime so plan accordingly. When using NEWA tools, keep a record of growth stage and trap catch dates and enter them each time you use the tools. More info is in NEWA Default Biofix Dates. Try out the new Degree Day Calculator on NEWA. This entry was posted in about models, news on April 12, 2016 by jec3@cornell.edu.